WOO PIG! Today we are headed to Arkansas to hear about what's in store for the University of Arkansas Razorback Marching Band from Director Ben Lorenzo who enters into year number two. You are now headed into year two at Arkansas, what are you looking forward to the most this season? What did you learn last year that you want to change or improve on? Now that I have been here for a year, I have a better idea of Arkansas’ deep traditions and strong support for the Razorback Band. It also has given me the opportunity to develop rapport with my students and colleagues. For year two, I want to continue to grow as a musician, educator, and administrator to give our students the best possible experience in this ensemble. Our band camp is called Early Week and began on August 12 with a leadership camp. Our new members and leadership team report early in the day on Friday, August 12 and the full band is not together until following evening. The first meeting with the full band is my favorite part of Early Week. It feels great to get the wide-eye first year members in the room with all the excited returning members. We will be taking the full band to War Memorial Stadium for our home game in Little Rock and to AT&T Stadium for the Southwest Classic in Arlington for the game against Texas A&M. Our first two shows will be about super heroes and divas, respectively. We have some great arrangements and we think our fans will enjoy some of the surprises we have planned in the drill. 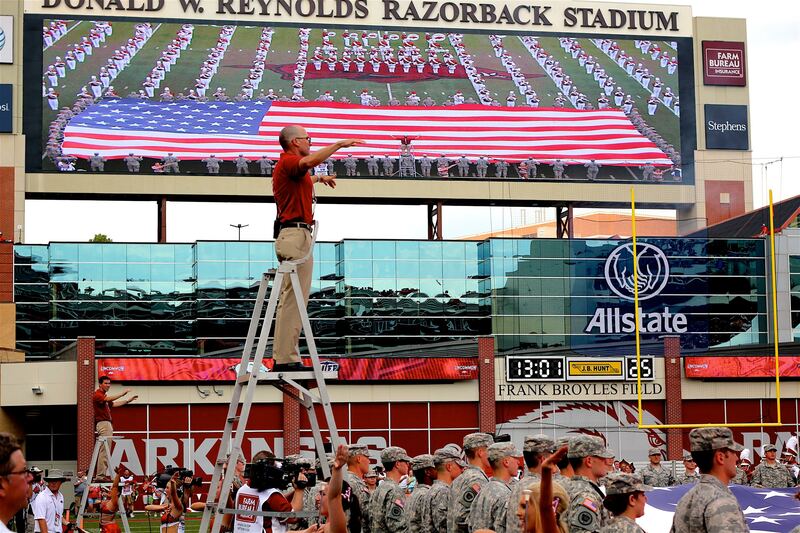 If there was one other band in the country that you'd love to host at Arkansas who would it be and why? Who will you host this year? It is difficult to pick just one. I would love to host any of the bands that my friends teach. We share ideas, questions, and stories throughout the year, so it would be great to see/hear their groups in person. We always enjoy seeing the Fightin’ Texas Aggie Band at our game in Arlington each year. Also, we are looking forward to hosting several pep bands from our friends across the SEC. This the 143rd edition of the Razorback Band We have so many current student, alumni, friends, and fans that share a connection to our program and look forward to our performances. We love the part we play not only on Razorback Game Day but events that happen on and off campus all year long. We want to make all those people proud as we represent them, our university, and our state. Trust me, we have lots of fun along the way but we take that responsibility seriously. We hope our students come away from this band knowing that each one of them plays a vital role in the success of the group. Our students come from every college on campus and from so many backgrounds. We hope they see the strength that comes from a diverse group of people striving toward a larger goal. I am sure many of our students have figured it out, but I really dislike heights. Having the necessity to see the shows from atop a scissor lift can pose a little bit of a challenge for me. I also have a sweet tooth. I’ve never met a dessert I didn’t like.